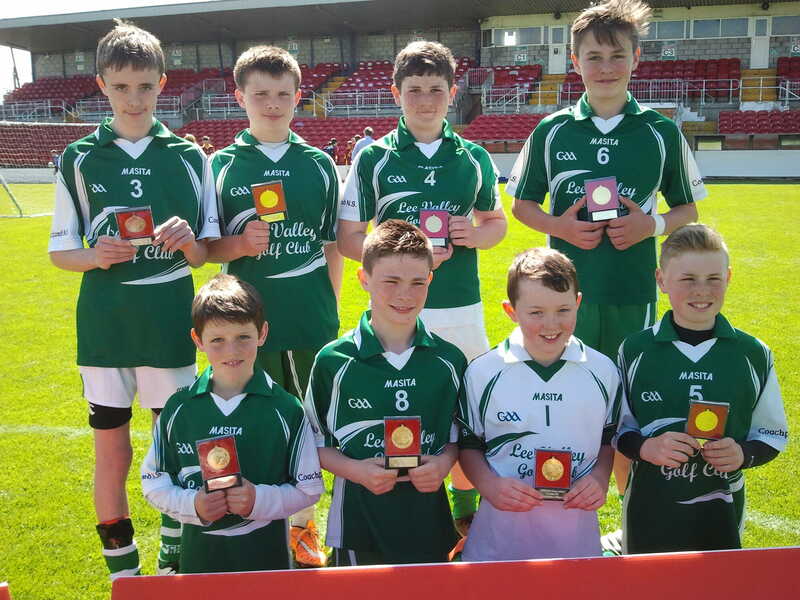 The Coachford National School, 5 a-side soccer team won the county finals last week in Turners Cross and now go on to represent Cork in the Munster final in Ennis on April 28th. The eight strong panel coached by Mr. Horan remained unbeaten all day after accounting for Clogheen/Kerry Pike, Banteer and Drinagh. The boys; David O’ Shea, Ciaran O’Connell, Sean Buckley, Ardghal O’ Buachalla, Brian Dineen, Tony Nolan ,Brendan Harrington and Jack Moynihan played outstanding all day and came from 3-1 down to draw with Banteer in the second game of the finals. The lads had already defeated the very fancied, Kerry Pike/Clogheen by 4-1 in the first game . Although the other schools brought huge support with them from West and North Cork, Coachford had a steely tenacity about them all day and were determined to reach the provincial finals for a second year in a row. O’Riordan’s Bar Coachford is hosting a ‘Music for Marymount’ charity night on Friday May 1st. Music for the night will be supplied by the very popular ‘Sea Captains’. This five piece band always draw a huge crowd wherever they play and the organisers of the Bank Holiday weekend fundraiser are hoping that they prove a huge attraction to their event. Pat O Riordan of O’Riordan’s Bar said “ We are delighted to be associated with this fundraising initiative for Marymount Hospice. Like every other community in the county we are well aware of the huge comfort and support that Marymount offers to patients and their families and we are also aware of the funds needed on a regular basis to maintain and grow this level of service. We are hoping that this ‘Music for Marymount’ night will be a great success and will help to raise much needed funds for the hospice.” The Sea Captains are offering their services free of charge for the night and there will be no cover charge on the door. Donation buckets will be passed around and a raffle will also take place. The bigger the crowd the bigger the amount raised. The Coachford B team play UCC A team in the Corinthian Cup Semi Final on Saturday afternoon at the Farm in Bishopstown at 2pm. The lads have been waiting a few weeks for this game and will be the underdogs against one of the finest teams in the competition and the team that are hotly tipped to win it out from the day the draw was first made a few months ago. The winners go on to meet either Lakewood or Rathcoole Rovers in the final. The Coachford Premier team play rivals Kilumney on Tuesday April 27th at 6.45pm in the league at the Farm in Bishopstown. Aghabullogue Intermediate Footballers begin their 2015 Championship campaign this weekend when they play Mitchelstown in Mallow on Saturday at 7.00pm. Aghabullogue were defeated by Mitchelstown last year in the 4th round of the championship. The team from North Cork easily defeated the Mid Cork boys in 2014 and will be firm favourites again this year to advance at the expense of Aghabullogue. The Coachford based team have enjoyed a fairly positive league campaign but now face the toughest test of the year. The losers on Saturday face either Adrigole or Glanworth in the second round. Aghabullogue National School Parents Association will hold a table quiz in Cremin’s Bar Aghabullogue on Saturday night at 8.30pm. This promises to be a fun filled night with questions to suit all tastes. Tables of four will only be €20 and there will be great prizes for the winners and runners up. The organisers of the Coachford Autumn Festival have announced that they are holding the second ever ‘Voice of the Festival’ on Saturday August 15th. Chairman of the Festival committee, Tadgh Murphy said “ We are delighted to again host this very successful event. Last year’s competition was a huge success and the standard of singing was superb. Each performer was sponsored by a local business outlet and we are hoping that the businesses in the area get behind the event again this year and start identifying their representatives within the next few weeks. One to one tuition on the use of computers, Smartphones, I-Pads etc has been offered to the members of the Coachford Active Retirement Association in Ballincollig on Friday’s from 12.30pm to 3.00pm. If you are interested please contact Vonnie Steffens at 021 7334462. This entry was posted in Useful Numbers and tagged Aghabulllogue GAA, Aghabullogue Coachford Rylane Community Council, Aghabullogue National School, Broomhill Vintage Club, Coachford, Coachford AFC, Coachford national School, Marymount Fundraiser, O'Riordans Bar. Bookmark the permalink.